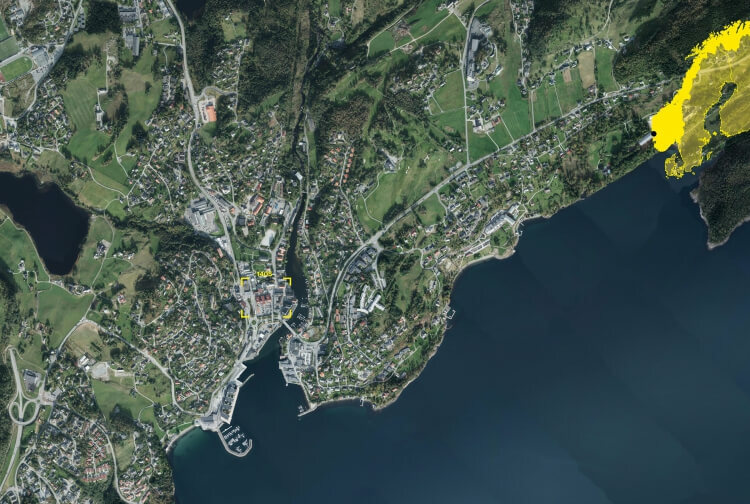 The town centre of Osøyro is defined by the presence of Os town hall and surrounding cluster of buildings housing commercial activity and businesses. The new town centre at Os brings the shops and town hall at ground level together with a shared pavement and enveloping canopy, each appropriating itself differently of their new frontage. The steel canopy is an iteration of the traditional Os timber canopies at the formed train station, given a modern twist and using the local steel heritage. The town centre was given a shared-pavement solution where pedestrians and cars are given equal importance in the streetscape. With this came the introduction of a cultural pavilion at the centre of the square. An orthogonal grid organises the pavement elements. Larger stones define pedestrian areas, and smaller ones define shared pavement between pedestrian and motor circulation. The transition between the two is made gradually. Along this, strategic stone sculptures were added to punctuate the space and emphasize a certain directionality towards the Town Hall and river. The newly paved spaces pull surrounding street arteries in, not limiting itself to the main spaces but also bleeding in to surrounded streets. This patchwork requalifies the space and gives new meaning to the buildings fronting it. The pavilion at the centre of the larger square is today a café, restaurant and an open marked space under the canopies for different food markets and arrangements, used by the community and for the first time introducing a place where people can have a break and enjoy their town centre. On top of this café a new rooftop, at the scale of the surrounding buildings, provides a new perspective over the square. The canopy arranged along segments of the periphery of the site emphasizes the new areas with a new identity and sense of place. At night, the canopy glows thanks to LED strips running along its joints. Its construction was done in conjunction with local artisans. Prior to 3RW’s intervention, this urban centre was dominated by vehicle circulation rather than people – motor roads, a parking lot and little space for pedestrian circulation. This was affecting civic pride and driving commercial activity out of the centre. For many decades, Os has prioritized the location of large parts of the different urban programmes to the outskirts of the city centre, consequently creating so-called extremities, or mono-functional enclaves. Such outsourcing created at least one clear hurdle: by placing large parts of the city’s core activities in the peripheries, the city itself became peripheral. This is a common problem for many Norwegian cities. However, we now see the contours of a new movement, in the way many communities now wish to bring back formerly vulnerable services: it is about bringing back services and functions. The starting point for the project was to prioritise pedestrian circulation and access to the space. Equally important was to emphasize the connection to the river, which streams past the centre, and to give the ground level shops structural importance in the redefinition of the town centre. A typical peripheral Norwegian town, over the last 30 years Osøyro’s character eroded through fragmented developments that gradually transformed it into an uninviting and seldom used public space. The aim of this project is to requalify this town centre as a civic entity bustling with commercial activity. The new river plaza, located at the culmination point of the town centre, is designed for water sports, bathing and recreation. Today, the square is heavily used for special occasions (the Norwegian National Day, Christmas events, and so on) as well as on day-to-day life, and new shops have opened. Many existing and new shops are using the street like they haven’t before – placing merchandise and DIY seating outside under the canopies and appropriating themselves of this new buffer between society and commerce. The Town Centre of Os is used at different times of the day with different intensities – but it has become a new ‘destination’, a new place to shop and hang out. Ultimately, it is the idea of public space that is at stake in this project, the creation of a place that is part of a multi-modal network, setting up a hierarchy of collective spaces with degrees of publicness that hopefully creates an enjoyable and performative public space.